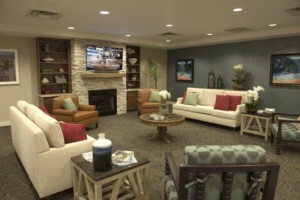 Hamilton Township, NJ: As part of its continuing expansion, Princeton, New Jersey-based Solvere living will open its $59.1 million Homestead at Hamilton senior living community in historic Hamilton Township, New Jersey. The February 8th grand opening features a wide array of live entertainment, cuisine and refreshments. Mayor Kelly A. Yaede, area officials and the public will share in the festivities. Completed on time and at budget, the 24-acre site at 2560 Kuser Road is designed to help serve a growing demand for senior living in New Jersey’s Mercer County and the Trenton metro area. The community offers independent living, assisted living and memory care, and expects to create more than 450 direct and indirect area jobs with an annual payroll in excess of $3 million. Solvere, rooted in Latin for “to solve,” creates value-driven, innovative solutions for its senior living partners. Through its team of professionals in business, finance, operations and marketing, Solvere currently manages communities in eight states, including Florida, New York, New Jersey, Texas, Maryland, West Virginia, Virginia and Indiana. Its partner company, Solutions Advisors, provides marketing, sales, consulting and creative services to the senior housing industry nationwide. The four-story community was built by Paterson, NJ-based Pike Construction Co., LLC, a longtime senior housing contractor and real estate development firm. Established in 1958, Pike has built more than 15,000 units of senior housing ranging in project size from $10 million to over $150 million in total construction costs. The architectural firm for Homestead is J. Randolph Parry Architects PC, headquartered in Riverton, New Jersey. Founded in 1996, the company is an award winning architectural design firm with a specialty in residential and senior housing. The community is overseen by General Manager Andy Fritz, who brings more than 22 years’ experience in all facets of senior living, holds a Master’s Degree in Healthcare Administration from Widener University and is a licensed healthcare professional throughout the state of New Jersey. Marketing Director Michele Schreck has more than 30 years’ experience in independent living, assisted living, memory care and skilled nursing. 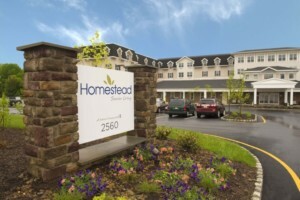 Homestead offers 96 independent living apartments, 75 assisted living apartments and a memory care neighborhood of 24 apartments, all designed for maximum living space and natural light. Amenities and services include multiple casual and fine dining venues, two art studios, performing arts center, theater, libraries, fitness gym and studio, salon, concierge, transportation and a sundry shop. Homestead also provides Solvere’s proprietary Salus™ and Valeo™ programs. Salus, Latin for “well-being,” is a holistic approach that focuses on each resident’s potential to achieve his or her personal goals through engagement and connection. Valeo, Latin for “to thrive,” focuses specifically on wellness initiatives for those with memory impairments and incorporates components that examine residents’ social, intellectual, spiritual and physical well-being. “Our Salus and Valeo programs are designed for successful aging by touching every aspect of residents’ lives and keeping them feeling engaged, honored and fulfilled,” Kutac-Ward said. The media contact for more information about Solvere Living and Homestead at Hamilton is Scott McCaskey at Goldman & Associates Public Relations at 757-625-2518, ext. 3 or at: scott@goldmanandassociates.com. Visit Homestead at Hamilton at www.homesteadathamilton.com.